Mom and I had been perusing row after row of handbags in silent agony for nearly half an hour before Celeste approached us. She seemed like a discerning salesperson, but maybe I was giving her too much credit, and it was only the orange eye shadow that created an air of attentiveness. “We’re just looking for something basic, nothing crazy,” Mom said, her voice resolute with frustration. It was a Saturday night in the accessories department at Nordstrom, and it was unclear which of us was having a worse time. “Let me see what I can do,” Celeste said, snapping her fingers as she made her way to the stockroom. In her abrupt absence, I grew overwhelmed by the throng of mid-evening shoppers descending upon us: women spritzing perfumes and applying concealers on our left, women complaining about the lack of arch support in Steve Madden boots on our right. And me, in the middle, looking all around to see if there was anyone in the immediate vicinity that I knew. “One day you’ll appreciate me,” Mom said, reading my facial expressions with her eerily accurate ability. 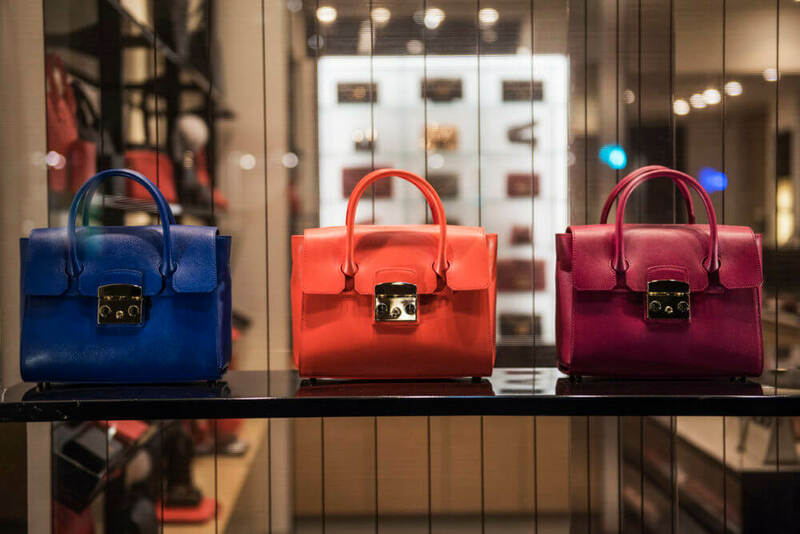 “I spend my Saturday night trying to find you a nice bag, and all you can think about is who you might run into.” I knew she was right, of course, and that my self-consciousness wasn’t exactly admirable, but it couldn’t stop me from feeling it. Especially since I was almost positive that I just saw Katie, Maureen, and Rebecca walking by, wearing skintight dresses and drinking sodas that were bigger than their heads. My throat was closing up. I knew I needed to figure out a way to excuse myself. “I’m just going to use the ladies room,” I told Mom. Once she was out of sight, my brisk walk turned into a jog, and I weaved through maternity clothes, luggage, and swimwear before making my way out the side exit, where I caught up with my friends. Not surprisingly, Katie turned her head first, and then Maureen and Rebecca followed suit, collectively pursing their lips and surveying me as if I were lost. “I thought it was you,” I said. “How’s it going?” I was out of breath, and I hated myself for it. “Fine,” Katie said. She looked towards Nordstrom, as if trying to place where I’d just been. “What are you up to?” she asked. The syllables and the intonation expressed just the right amount of surprise and curiosity, but her eyes already knew, and didn’t care. “I know,” I said. “I didn’t say anything.” I hoped Katie would express some acknowledgement of this, some appreciation, but she was typing something in her phone, and by the utter indifference of her expression I could tell she was done with me. I felt lightheaded, and with no purse to grab onto, all I could do was hug my arms. “We have to go,” Katie said, responding to a lit-up text as if it were a sacred affirmation, and Maureen and Rebecca, doting disciples that they were, already started walking away. “Later,” Katie said to me, as an afterthought, before they moved along, heading to whatever destiny was awaiting them next. I sighed, keeping my head down as I retraced my path through Nordstrom’s labyrinth, my return to accessories conveniently coinciding with Celeste placing an armful of Coach and Marc Jacobs purses by my mother’s side. “Look, I appreciate the gesture, but we’re really looking for something more basic,” Mom said. “It’s for my daughter over here. She’s only 14.” She gestured to me halfheartedly, the unimpressive source of evidence. “Ma’am, this is a luxury department store. If you want basic, this is what we have,” Celeste said. Mom sighed, and I could see in the way Celeste’s eyes narrowed that she seemed to take it personally. “You could always go to Forever 21,” she said, her tone clipped, maybe even nasty. Mom was a proud woman with long legs, and I struggled to keep pace with her in the best conditions, least of all when she was pissed off at a department store. As her heels click-clacked against the granite en route to the elevator, she rambled on about the fakeness of salespeople, the insincere warmth bundled entirely around the promise of a commission, as if somehow, after over forty years on this planet, that could have still even shocked her. “To Forever 21, then?” she said, and I paused for a moment, wondering if I’d run into Katie, Maureen, and Rebecca again, before dismissing it quickly. I knew that on a Saturday night, buying clothes was the last thing on their mind. But as we rose up the escalator I was overcome with the déjà vu of being on the same escalator with my friends just the Saturday before—the four of us in a line: Katie, first, then, me, then Maureen, and then Rebecca, our faces caked in foundation and lips covered in gloss, each immersed in the wilderness of our phones. Katie was smiling her secretive smile, saying these guys were going to be great, and I hadn’t wanted to let on my excitement, my belief that for once maybe something interesting was about to happen. Funny how, in the span of a week, nothing could have felt further from the truth. Mom and I reached the third floor and a glittering panorama of shops spread before us, with more boots, bras, underwear and angel wings than anyone could know what to do with. Families trotted by with their unruly children, women dragged their boyfriends in tow, and Reginald Wilkins, one of the few black guys at my very white school, trailed a sizable difference behind his father, who he appeared to be on an equally unwanted retreat with. We made eye contact and smiled, clearly embarrassed by our choice of company. But oddly enough, our parents seemed to exchange knowing smiles too. “Sort of,” I said, in that vague way I knew everyone. Reginald sat next to me in Geometry and made bad puns that sometimes made me laugh. He was tall and thin and wore beanies and ironic t-shirts that were mild enough to be universally socially acceptable. Katie said once she thought he was cute, and he might have even been one of her pursuits, had she not been so focused on hooking up with older guys. Running into him at the mall, even if he was with his dad, only increased my awareness of my own fallen social state. Depressed, I entered Forever 21 and grabbed the first purse I could find. Lynette heaved a weary sigh, as if she had spent her whole life thus far trying to avoid people like my mother. “You’d be better off at Nordstrom’s,” she said, her voice filled with disdain. I knew she wanted to go to Auntie Anne’s, the one tucked between the movie theatre and the virtual reality store, because if I knew one thing about my mother, it was that soft baked pretzels were her weakness. And normally they’d be mine, too, but nothing felt right that night. Auntie Anne’s was exactly where we’d been the week before, in our stupidly tight clothes, when we had met the guys. Katie had already met Luke a couple times prior and had succumbed to a particularly powerful strain of lust. He was praised in her eyes as a God and in her phone with a heart-eyed emoji, and I knew, from the moment I saw them together, they were trying to figure out a way to be alone. Maureen and Rebecca, in predictable fashion, conveniently affixed themselves to the burnout friends with forgettable names, leaving me with Luke’s younger brother, the surly looking skater kid with beach blonde hair tucked under a trucker hat. Connor. I nodded. Just the week before, Connor and I had been in the same line, and I had ordered the same thing. He had crinkled his nose in disgust, declaring his intense aversion to cheese. I had asked if he was lactose intolerant, and he said only cheese intolerant, which, for some reason, I had found endearing. Mom paid the cashier and handed me my pretzel, and we made our way to the plastic tables outside. I averted my eyes from the influx of people gathering around, the neon lights of the theatre and long winding line around the virtual reality store only exacerbating my headache. “Sarah, do you feel like you can count on your friends?” Mom said. My stomach did that queasy dip it did so often in those days, a daily cycle that seemed as inevitable as REM sleep. I shrugged. “She’s fine,” I said. My hands were trembling, and I spilled hot butter down my shirt. For a moment I mourned it, the pool of grease dripping down the left side of my peasant blouse, before realizing that it, like everything else I owned, was barely worth a damn thing anyway. I shook my head, biting down on my lip so I wouldn’t laugh. My mother clearly didn’t understand that in ninth grade, being popular meant being happy. It meant going to the mall on weekend nights wearing your skimpiest clothes under sweatshirts, meeting up with guys who thought you were pretty, about doing things that would make you agreeable to them. For me, it meant teaming up with Connor after our friends paired off, following his lead in making our way to the virtual reality store, waiting in the long line of gamers before putting on our headsets and grabbing our controllers. I couldn’t tell my mom that that was when I had been set free. That reality had shifted from the confines of the VR shop to a basketball court, and Connor and I had transformed from teenagers to pixilated teammates in jerseys, that my muscles had uncoiled as I jumped and crouched and shifted from side to side, temporarily rid of the self-consciousness that plagued me. “I am happy,” I said, a piece of pretzel lodged in my throat. I coughed it down, and, desperate for a distraction, looked into the VR shop, as if hoping the reflection in the glass could assert some sort of confirmation. I could see Reginald in there, wearing a headset and holding two controllers. He was jumping up and down and circling another player, as if they were in some choreographed dance, and I knew, instantly, Reginald was playing the same game that Connor and I had the week before. I was momentarily struck by the intensity of his movements, and it brought to mind seeing him running around the track when I was at gym class, watching his arms pump back and forth like his life depended on it, so far ahead from the rest of the pack it almost seemed funny. It was the only time I had sensed a restlessness in him so at odds with his breezy hallway persona, as if by going fast enough he could somehow transcend the confines of our high school and break free. “Look,” my mom said, redirecting my focus, “I’m not trying to tell you who to hang out with. I know Katie’s your friend even if she walks around thinking she’s queen bee, and Maureen and Rebecca worship the ground she walks on. All I’m trying to say is that you have options. I’m sure there’s plenty of other nice girls you could spend your time with.” She looked distracted, her face flustered and eyes dreamy, and when I turned around, I saw Bernard Wilkins sit down with a hot pretzel on his tray, checking his watch with a stern expression on his face. She barely seemed to register my snarky tone as she walked over and said hello. I was irritated that a divorced woman in her forties could grow so obviously giddy over a crush, and watching them flirt by Bernard’s table, my own unhappiness grew more palpable. The truth was there were so many things I wanted to tell my mom but couldn’t, because I felt that my stories were too fragile, too secret, that they had to remain stored inside of me. How could I tell her that when I had left the virtual reality store with Connor, my steps were jagged, because the real world didn’t seem fully real yet? Or that when we had rejoined our friends, so obviously giddy from hookups, hair disheveled and faces filled with vacant grins, it made me uncomfortable, like I was already left behind? Or how we had all spent what seemed like a long time wandering through the mall, laughing at window displays, before Connor pulled me under the awning at Sam’s Sporting Goods and kissed me, my lips tentatively reciprocating until his lizard tongue met mine, and I backed away. “Maybe another time,” I said, and his brother laughed, and for just a moment I thought I saw the slightest glimmer of hurt cross Connor’s face before he reclaimed his hooded stoicism and grabbed my bag. “Hey, bring that back!” I yelled, as Connor skipped past Sam’s Sporting Goods towards Pacific Swimwear, laughing as if he had got me good in an ultimate practical joke. “I’m just messing with you,” he said, his grin a mile wide. “Here, catch it.” He tossed my purse as if it was a Frisbee, and it spun in midair before sinking, shamelessly, into the central mall fountain. “Something like that,” I said, shame coating my throat, more for how I panicked than for the lost items themselves. So I made up some excuse about how I didn’t feel well and told them to all go on ahead without me, that I’d figure out my own way home. And no one tried to stop me when I walked into Louie’s Puzzles and Toys and asked to borrow their phone, calling my mother and telling her, in a haste, that my purse had just fallen into the toilet, and could she please just pick me up. I looked up to see my mother’s hand on Bernard’s shoulder, her shoulders arching back to express the high lilt of her laugh. Rolling my eyes, I made my way into Auntie Anne’s to buy an extra large Diet Coke, and started counting my money when I heard an unmistakably familiar voice shouting out. I looked up to see a group of people gathered outside the virtual reality store, and after telling the lady at the counter to keep the change, made my way to the action. That’s where I saw, in the middle of it all, a clear dispute brewing between a mall cop and Reginald. “No, man,” Reginald said. He was wearing the typical beanie that covered up his mound of curls, and a Wayne’s World t-shirt, fitting in perfectly with our high school’s hipster SoCal fashion aesthetic. He paused, for a minute, as if finally grasping the punch line for a tasteless joke. “Oh, wait, Officer, you mean Derek? Officer, there’s some kind of misunderstanding. I was playing a VR basketball game with my friend Derek and I might’ve pushed him but it was completely unintentional, we were just in the moment. Derek will tell you.” He turned to look for his friend, who was nowhere in sight. “Hold your arms out in front of you,” Officer McConnell said. “Why don’t you let me be the judge of that,” Officer McConnell said, patting down Reginald’s arms and his elbows. Reginald looked straight ahead, his eyes filled with that faraway focus I had seen on the track field, as if trying to channel anywhere else. Officer McConnell stepped back reflexively, as if he had been slapped across the face. “You caused a disturbance, I respond, and you tell me there’s no basis? I’d be real careful if I were you,” he said, frisking Reginald’s back, and Reginald bowed his head down, as though he knew, at this point, being careful was useless, that the cards were stacked against him and he already lost. And then he looked up, his eyes scanning the crowd before stopping to meet mine and squinting in recognition. The crowd turned towards me, and in that moment, everything felt fuzzy, much like how I’d felt when I left the virtual reality store and the world wasn’t behind a headset anymore, but splayed out in front of my direct view, as bizarre as ever but with no settings in which to modify. Reginald looked at me in a way in which no one had looked at me before: like I, his occasional Geometry friend, was his only hope. And before I knew what I was doing, I cleared my gravelly throat and turned to Officer McConnell. And I’ll never forget the way he laughed: like he was gasping for air, like he was spitting out beer in response to the most ridiculous thing he had ever heard. “Fair,” he said. “This girl wants to tell us what’s fair,” he said, turning to the crowd, as if to survey their opinion. He finished the pat down and told Reginald he could go, but he better watch his mouth, and his temper, or he’d find himself in trouble. As the crowd began to clear, Reginald took off his beanie, his curls covering his eyes. We faced each other. For a moment I wondered if any of my former friends were in the dispersing crowd, but that concern was soon eclipsed by finding Reginald’s dad and my mom, and wondering what in the hell we were going to tell them, and if it would only add to the laundry list of things that they wouldn’t understand. Jacqueline Berkman is a writer based in Los Angeles. Her short fiction has been published in The East Bay Review, The Writing Disorder, and Waccamaw, among other places. Her short story "Picking Locks" was adapted into the short film "Panofsky's Complaint," which will be screened at the Cannes Short Film Corner this May. Read more articles by Jacqueline Berkman. All original work attributed to Jacqueline Berkman © 2017 Jacqueline Berkman.